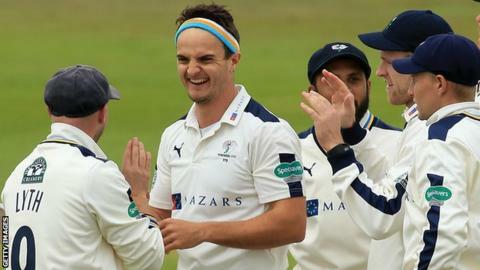 Jack Brooks led Yorkshire's fightback with four wickets as Nottinghamshire's middle order struggled at Trent Bridge. Steven Mullaney (78) hit 12 boundaries and two sixes in an aggressive start before England's Alex Hales went for 36 on his return to county cricket. However Brooks (4-74) and England's Adil Rashid (3-29) stifled the middle order as Notts lost wickets regularly. A late cameo from Stuart Broad (36) helped the home side reach 261 all out before bad light halted play early. Yorkshire struggled to make early inroads after Mullaney raced to 78 from just 80 balls but, having edged Steve Patterson to slip, Notts struggled to build on his start. Hales, rested from Nottinghamshire's opening two games, needed to impress in the wake of England rivals Sam Robson, Adam Lyth and Moeen Ali all making hundreds. He started in lively fashion, hitting eight boundaries from 53 deliveries before chipping Brooks to Joe Root at extra cover. Michael Lumb (49) was the only member of the middle-order to get to grips with the Yorkshire bowlers before being trapped lbw by Brooks. It was left to the tail, with Broad hitting seven boundaries before being run out by Brooks, to help Notts rescue their innings. "Myself and Alex Hales got us off to a bit of a flyer and gave us a decent platform but then we lost Alex, Greg Smith and myself before lunch, which was disappointing. "We've probably given them six or seven of the wickets but we will find out how good that score is tomorrow when we have a bowl on it. "They have been champions for the past two years for a reason but it could still be a good score if we bowl well." "I'm incredibly satisfied with that, from where we were after the first hour. "Andrew Gale said a few things at lunch - not ranting or raving, just quiet authority, and the guys were well aware of where we had gone wrong. "Steve Patterson played a big part in getting things back. He's a very important performer for us who just gets the job done."